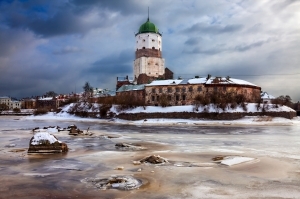 The historic town of Vyborg is located on the shores of the Gulf of Finland. Vyborg Castle, a typical example of Western medieval architecture in Russia, is a well-known symbol of this town. The Fortress’s appearance is unusual and differs significantly from the old Russian strongholds because Vyborg belonged to the Swedes from the beginning, for several centuries. The Castle faithfully protected at first the Swedish borders and later the Russian borders. In the 20th century Vyborg “retired” and was transformed into one of the most popular tourist attractions in the Northwestern Federal District. Although Vyborg Fortress is very old, the official date for when it was founded is known quite precisely as it is directly linked with the Third Crusade. In 1293, the Swedish forces landed on the shores of the north part of the Gulf of Finland and attacked the Karelian defences, located on a natural island, in order to conquer new territories and convert this pagan tribe into Christianity. During that year, the Swedes constructed a castle here and named it symbolically Vyborg (it means "Holy Tower" in an Old Swedish dialect). The oldest buildings within the Fortress were built in the middle of the island, on the hill, and were protected by a circular stone wall. The square stone Keep, which was the highest Scandinavian tower for a long time, is named after St Olaf, the famous King Olaf II Haraldsson who promoted education and brought Christianity to Norway. Tourists are surprised that there are so many buildings on the small Castle Island. 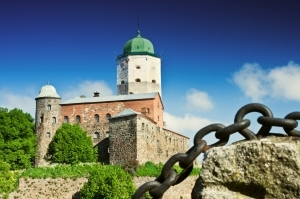 Some of them date back to the early history of Vyborg Castle. The Tower of St Olaf, the oldest building within the Castle, overlooks not only the castle complex but also all the buildings in Vyborg. During the 16th century, this medieval keep was demolished and reconstructed. The line between the old and new level can be easily traced as the former is made of granite rocks and the latter is made of brick. There is a viewing platform on the very top of this 48 metre tower. Although it is not easy to climb up the spiral stairs, you must do it to enjoy the incredibly picturesque panorama of the old town and the Gulf of Finland. Today, the Commandant's House, located at the entrance to the Castle, houses the permanent exhibition «Underwater Archaeology». The collection includes unique items which were found by researchers at the bottom of Vyborg Bay: parts of old vessels, cannons and many other things. 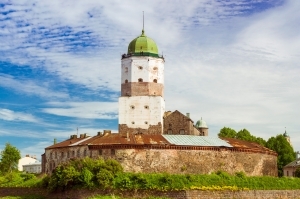 There are also several permanent exhibitions devoted to the early history of Vyborg Fortress in the main and eastern parts of the Castle: Swedish Vyborg, Vyborg as part of Sweden, Vyborg during World War II. The third floor of the Castle houses the exhibition "The Nature of the Karelian Isthmus", which will delight younger visitors because you can touch many items during this captivating trip. Those who are fond of interactive exhibitions will definitely remember the visit in the Torture Chamber, in the casemates of the castle prison, and the Knights Hall in the Wine Tavern, near the Tower of St Olaf, for a long time. In summer, the Castle is transformed into a lively cultural centre, full of various events. You can enjoy knights’ festivals, jazz concerts, rock and film festivals, theatre performances, historical reenactments and many others. Castle Museums: 9:00-18:00, closed on Mondays.